Looking for inexpensive party favors or bake sale goodie ideas? Try this easy recipe to make colorful sweet and salty popcorn. You probably already have all these ingredients in your pantry ! First you’re going to want to prepare the popcorn. You can use any popcorn you want but the quickest option is to purchase Instant Microwavable popcorn. Follow the instructions for 1 bag of popcorn, and then set aside to cool down. Next, Put the sugar and water in a small pan and boil to 238* on a candy thermometer or until your sugar mixture has been boiling for a few minutes and you see that it is thickening, and then add the food coloring of your choice, 2-3 drops should be enough. Next, remove your sugar mixture from the heat and in a large bowl, pour over your popcorn and mix until the sugar mixture is nicely distributed. 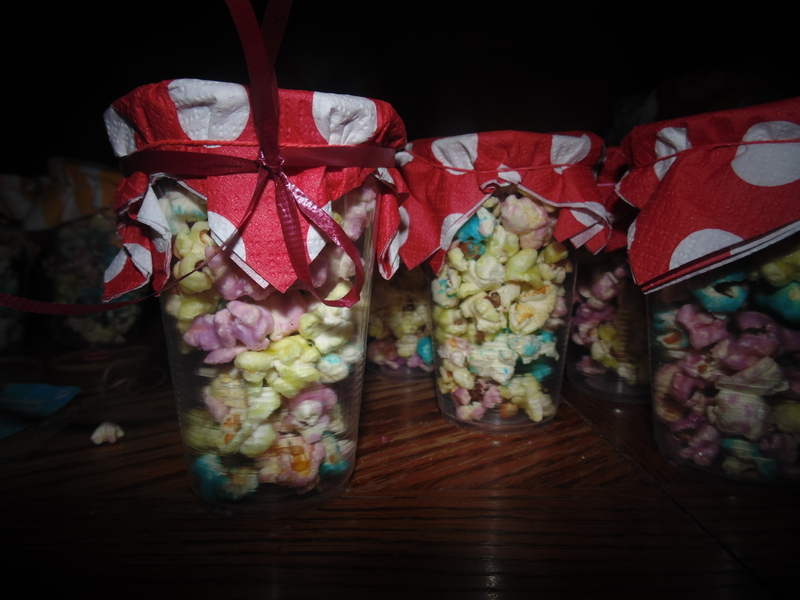 If you want to package the popcorn like what I did shown above, simply fill some clear cups with the popcorn, cover it with a napkin,seal it with a rubber band and then tie a ribbon around it if you want.